Rob began to take measurements with his assistant, Wynn. Using quarter inch plywood Rob created boxes inside the frame he made above. 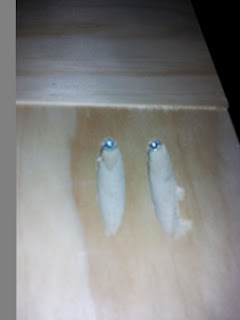 Rob used the Kreg system to screw together three white pine boards together for the lid.﻿ The first picture shows how the Kreg system is set up. Next Rob wanted to create a front for the cabinet using beadboard that we had leftover from another project. Rob used the table saw to cut a groove down the middle of a 1 by 4 that allowed him to slide the piece of beadboard in place. Then he matched the piece flush with the top panel of the front board he created. Using outdoor fabric and 3 inch foam from Joann Fabrics Rob added this to the top of the pine boards he put together above. He used a pneumatic staple gun to ﻿attach this easily. Here is our new shelf, hooks and baskets. The hooks are just high enough so the coats won't go over the pillows below. Paint/Painting Supplies: free because we used paint from other projects. Oh wow I love this! This is a completely adorable idea - and I LOVE the pillows! Thanks, Lori! I love your blog. This is such a great space! Love the pillows you got! Great makeover!! It looks fantastic! I bet it really opens up your entryway! Great job! Thank you very much, Jenny. What a great makeover! I'd love to do this with my hall closet, if it was only a little bigger. I'd love for you to share this at my Sunday linky party! Thank you so much, Kristin. I love love your blog. Thanks for inviting me to post on your page. Thanks for your visit :) This mudroom is coming along great, too! Hope you can also swing by in my Creative Bloggers' Party & Hop. Thanks so much, Linda! You are right about the potentially messy closet...lol. Wow this looks great! I love the pillows especially! And the beadboard. Great job, it's lovely! Wow, what a great use of space. I love the fun pillows you added. Thanks so much for stopping by my blog. I appreciate your comments on my felt pillow! I love a nook! Wish I had one...the shoes! The endless shoes! They seem to be all over, until you need them! Great bench, so fresh and clean! This is such a cute project1 I wish I had a closet to do this too! Visiting form the blog hop. Now following your cute blog. Would love for you to stop by and say hi! Thank you so much. I appreciate you stopping by. I'll be sure to visit. That is such a great idea. I absolutely love it. I found your blog on the hop and am following through GFC and Linky. Don't you love not being perfect? I do!! I'm your newest imperfect linky and GFC follower-stop by for a visit!! I love that look! You did such a great job. Thanks so much, Anne. I appreciate it. Thanks so much! I can't wait to check out your blog Lindsey. Thank you so much for linking up to the blog hop! I loved seeing my button in your listing :) Made me smile. Wishing you all the best in your bloggy endeavors. Newest follower! I am so in love with this idea! I finally took the doors off my kids room closets because they couldn't be shut. I'm pinning. I'd love for you to share this at my link party. It runs Tues-Sat. Thanks for the invitation to post on your link party. :) Good luck with your project. I love this redo..the bench is gorgeous! This is so cute and nice! and I love the pillows! I would love for you to stop by the Naturally-Nifty Linky Party and link up! Sooo cool! I love this and would love to do something similar to this in our entryway. 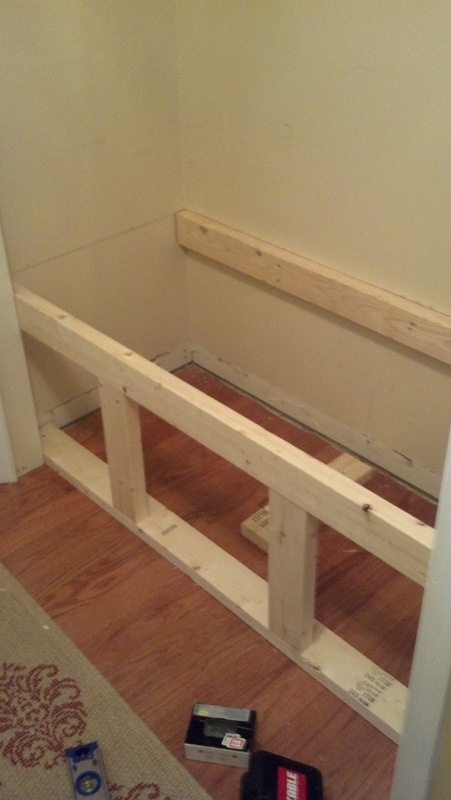 We don't have a closet, but we do have a largish foyer and I know we could build a simple bench seat like this one. What an inspiration!!! wow!! this is amazing!!! great job! Thanks so much, Jess. I appreciate your comments. Ooooh, I like that! Our entranceway is small too. Thanks for linking up to my party at Jillify It! I'm a new linky follower! Wow, this look great! I love a good mini-mudroom makeover! We just did ours in the fall, and I love it! Wow, so creative!!! And much nicer than a boring old closet! Great job. I really like how it turned out. I have poked around your site & I love it...I'm excited to be your newest follower! Such a good use of space. I want to do this with one of my closets downstairs. Beautiful transformation! I love what you did to create an adorable and useable space. Thanks for sharing. What paint color did you use for the grey in this closet? I tried to look back at the post and also in other comments, but still didn't see it. Thanks! Hi Jess, we actually didn't paint it grey. :) It is a light tan color that was already in place when we bought the house. If you'd like to know the color I can try and find a can of it around here somewhere. Wow!! I am so happy I got this project in my inbox from your yearly roundup! I love, love, love it! I really want to make a window seat in my master...can you send your husband my way?? lol, but seriously! ha! Great job! Just pinned. Love this idea. Just dropping in from Chrissy's Pinterest Party!! Love this project! Pinned! 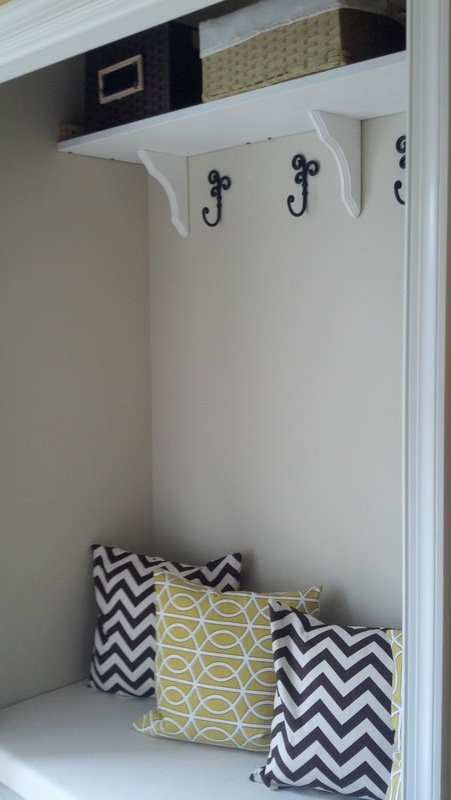 Love the pillows and the hooks! WOW! Yall are so talented! I wish my husband had skills like that. :) Pinning now! Thanks for joining the pin party! I just love how this turned out! It is so nice and organized! Wow, this turned out amazing. I wish i had a closet to do this with!!! Pinning now and sharing on FB later. We have the identical entryway and it is overflowing with coats. I have been thinking to do this same project but a bit nervous about where to put all the coats! (since my boys are now bigger than me, many, many man coats! LOL) But I have a large unfinished basement, so perhaps I could have a big closet put down there? Great job, love the pillows too! Hi! Currently working on doing something similar in our closet! How tall did you make the bench? Struggling with what height to use!